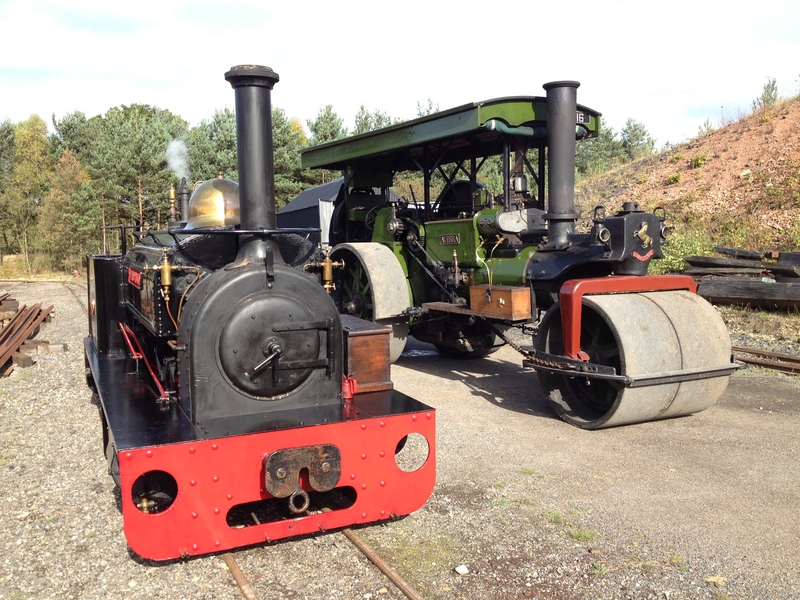 A mixture of workshop news and operations this week – with the first weekend marking our enhanced transport activity around site, something which will be repeated on November 1 and 2 before we winterise those items in the collection not needed over the colder months. 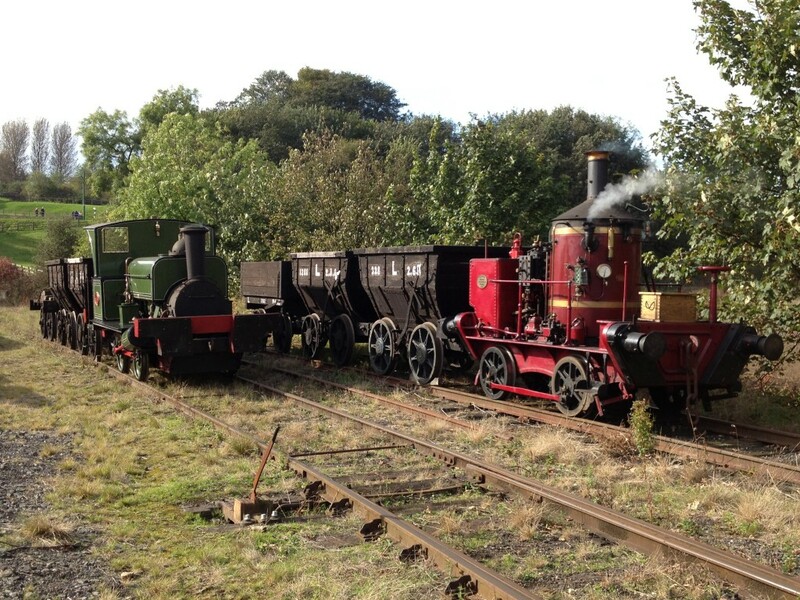 Over the weekend we saw the SOS bus, A&P steam roller ‘Ayesha’, No.1, No.18 and Edward Sholto at work. Here are a few grabbed photos taken on the Sunday, which was pleasantly sunny, with the Saturday being pretty much a washout! 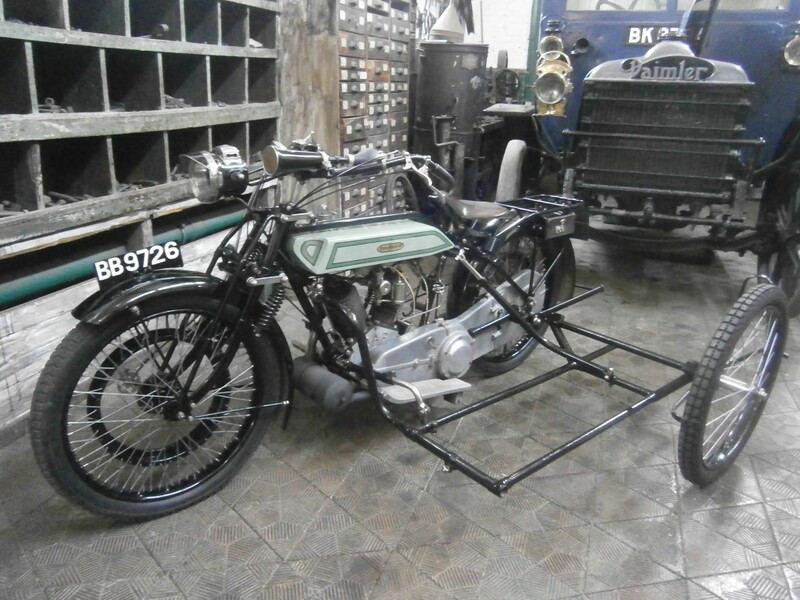 Below: Also during the weekend, the team restoring the Mills Fulford sidecar made a start on assembling the sidecar chassis onto the twin-cylinder Dene, appropriately enough in the Town Garage, surrounded by the remnants of the Dene Motorcycle Works in Newcastle. 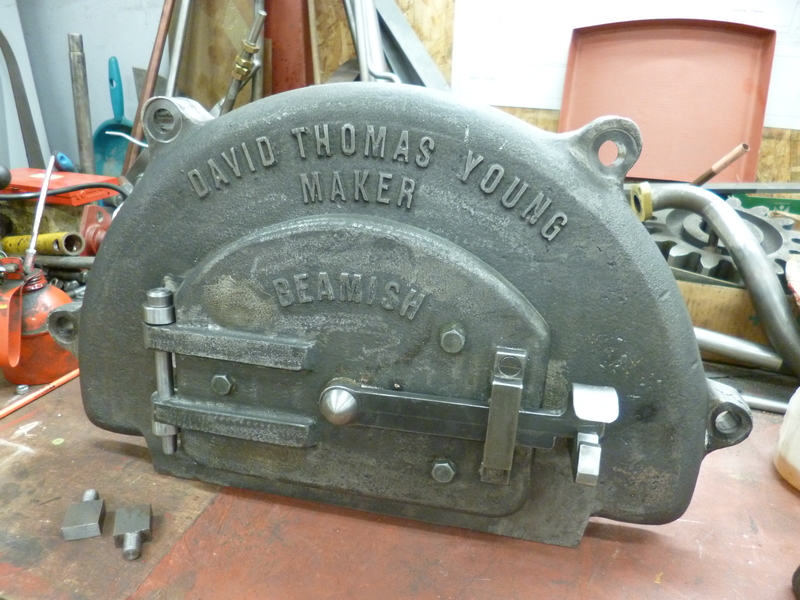 For more on this, see the article recently added to the blog under ‘Articles’ and describing the history of Dene and also our own machines. 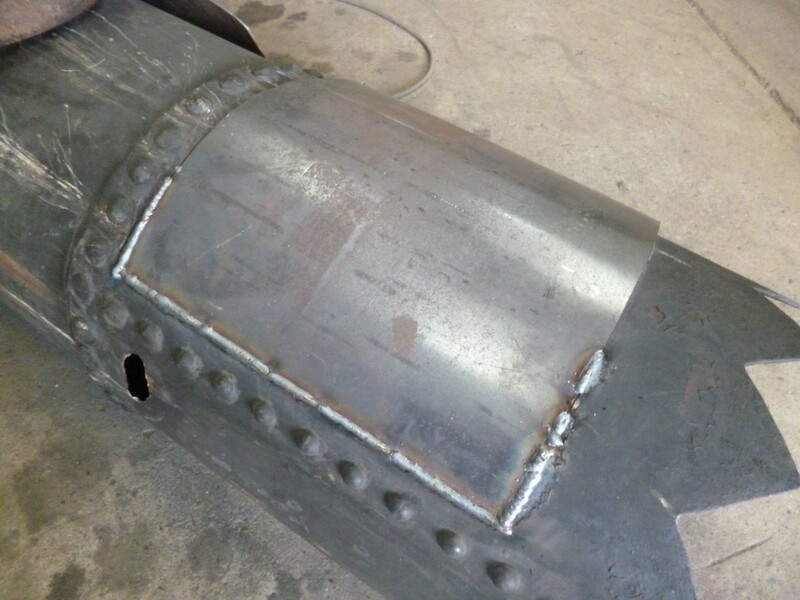 Below: Chris has undertaken repairs on Locomotion No.1’s chimney, with work in progress shown here to patch in new metal where the original top ring was heavily corroded. This itself is only five or six years old, which shows how aggressive the bi-products of coal combustion can be. Below: Last week the much awaited pendulums for Sunderland tram No.16’s truck arrived back following extensive reconstruction. 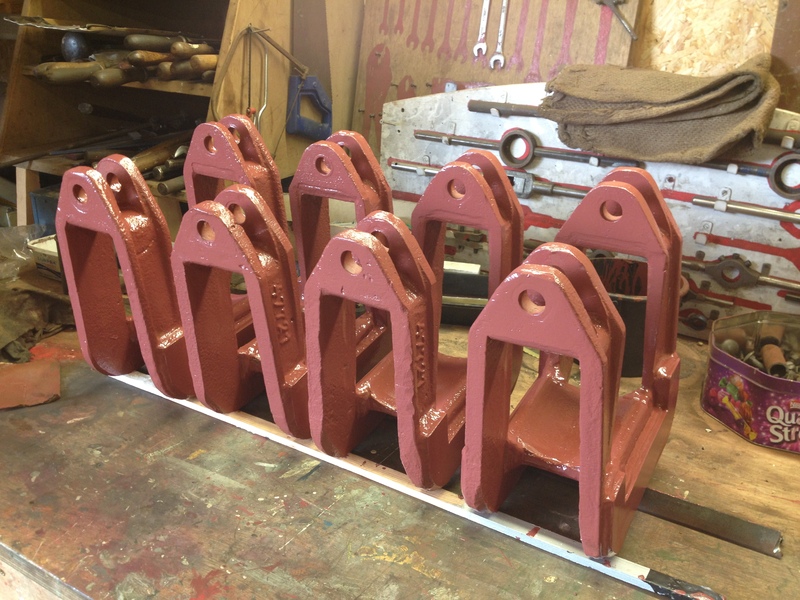 They are seen here in primer and will shortly be test fitted to the axleboxes before reconstruction of the truck can start in earnest. Below: Two views of the taper turning process. The job is now held between centres, i.e. 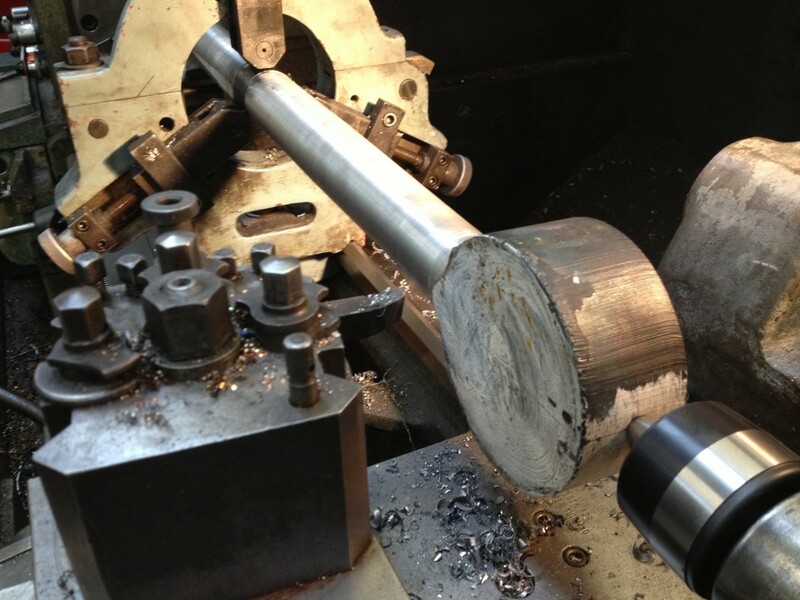 there are two points at each end onto which the rod is located, the drive to rotate it being by a bar inserted into the chuck. 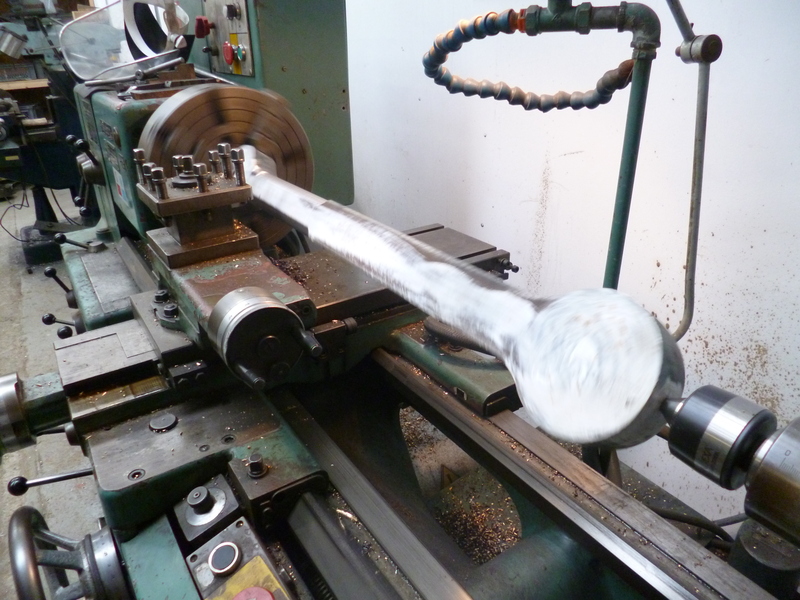 The taper attachment is to the rear of the lathe, and when set causes the cut to run away from the piece being machined, as it travels along, so producing a taper. 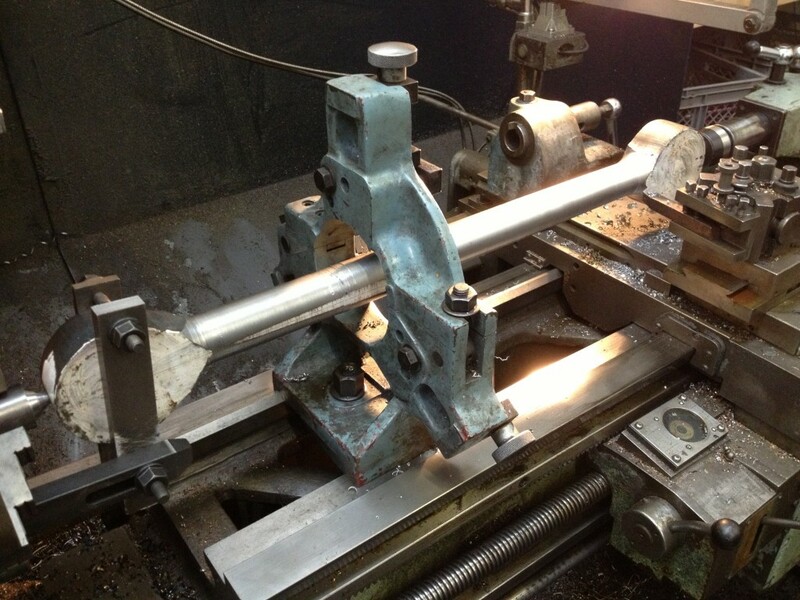 On this lathe the taper can be adjusted whilst the cut is being taken. 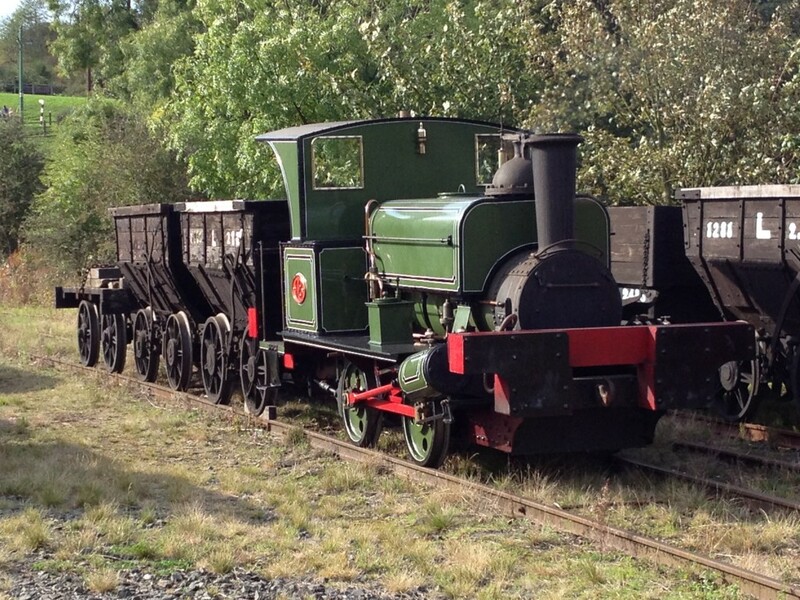 The fishbelly appearance on the rod adds so much to the character of the loco and so greatly increases the time taken to produce the finished rods – if this was a commercial venture you might reckon on adding a further week of man hours to the cost! Below: The completed firehole door surround and door, showing the locating eyes and door baffle (on the inside of the door itself). 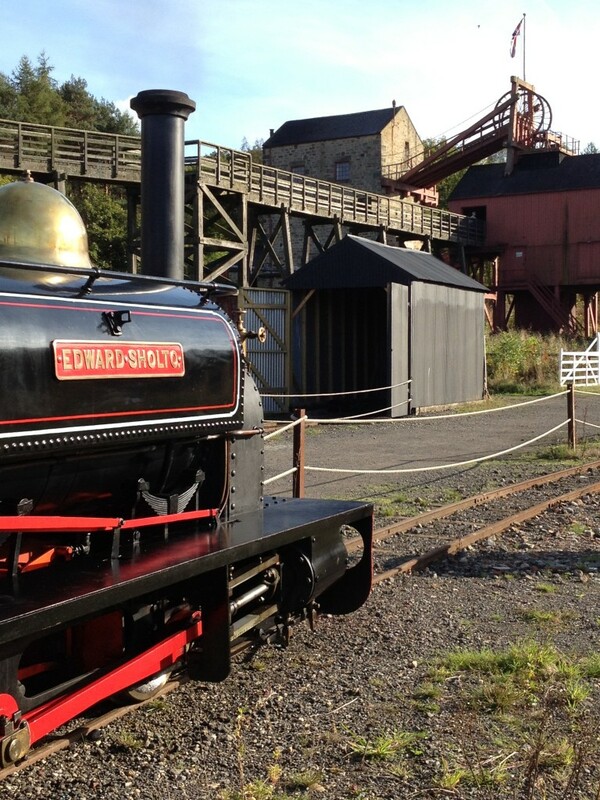 As Dave has built much of the loco, it only seems proper to cast his name in iron on it! 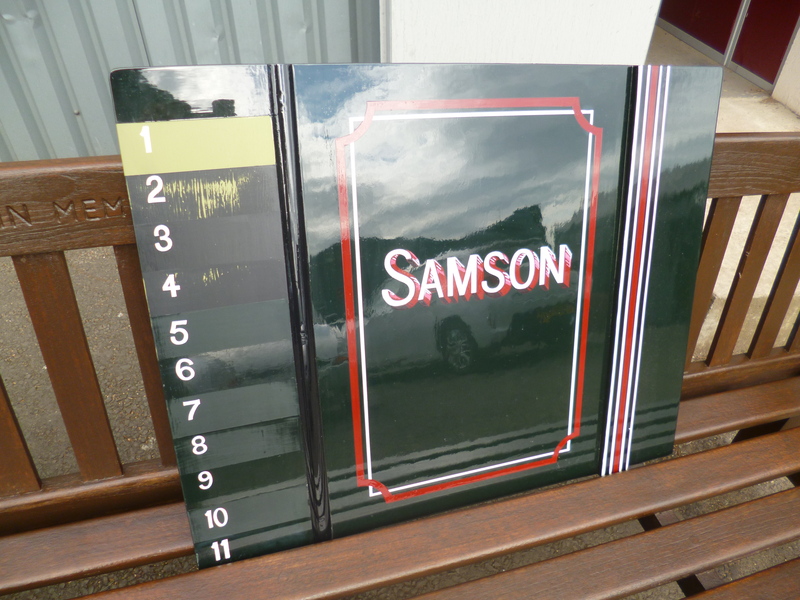 Below: I have finally completed the paint panel for Samson, which includes, on the left, the processes applied, and on the right a sample of the boiler band lining (though the white lines will be narrower on the finished engine). After lining and varnishing, I handed the panel over to my wife Sarah to apply the name. Again, the style on the loco will be a little different to this, we now have a panel showing how the finished livery will look – I wanted an old style in appearance and colour, and the panel is seen here outside in natural light, to prove that it is green! It does look black under artificial light. 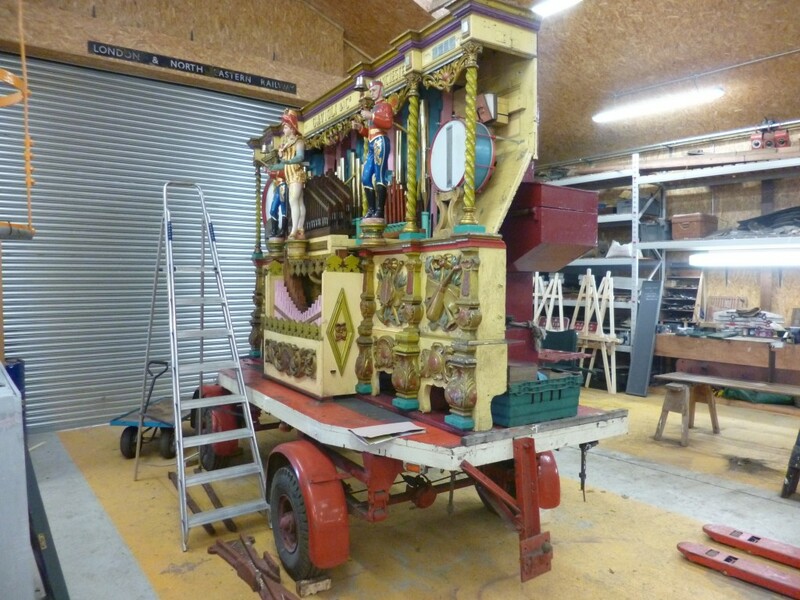 Below: The Gallopers organ is in the workshop for maintenance which includes repairs to the drive mechanism to the bellows, tuning and a deep clean, before taking its place back in the ride for Christmas. The protective poles installed to protect the figures are being replaced by brass poles, having themselves succumbed to visitors striking them as the ride passes – at least their sacrifice has protected the figures, which were taking something of a battering beforehand, to the extent we were not installing them due to the damage being inflicted upon them. 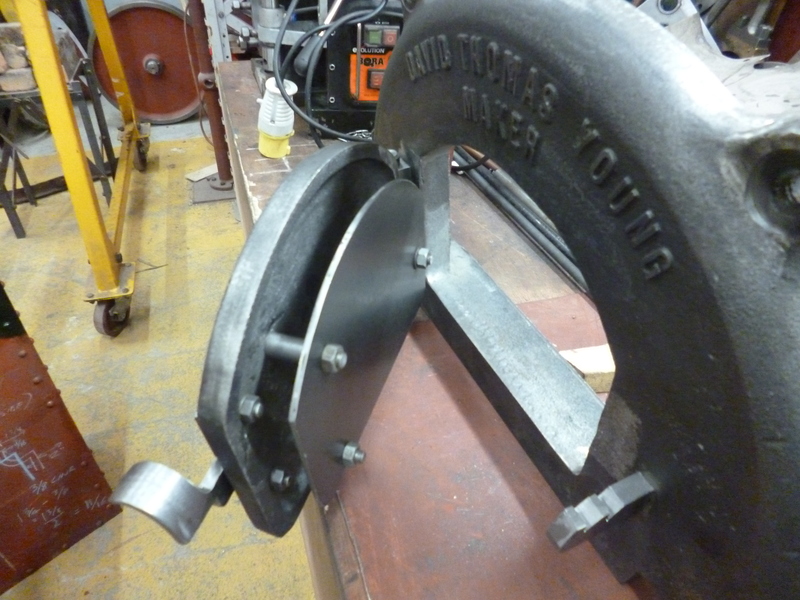 Below: Down in the RMS, Tony and Matt are working on the Duke of Sutherland’s coach, 58A. 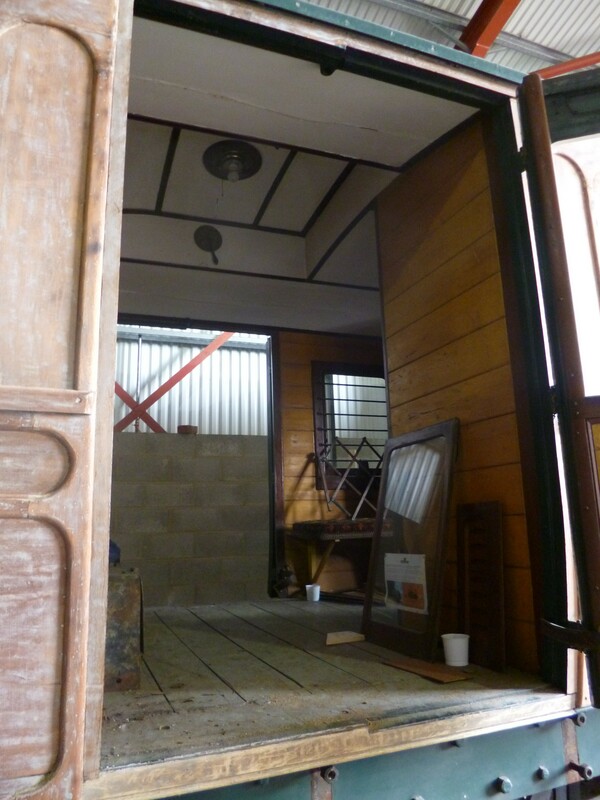 Doors have been removed for remedial work, droplights extracted to enable them to be stripped and varnished away from the body. 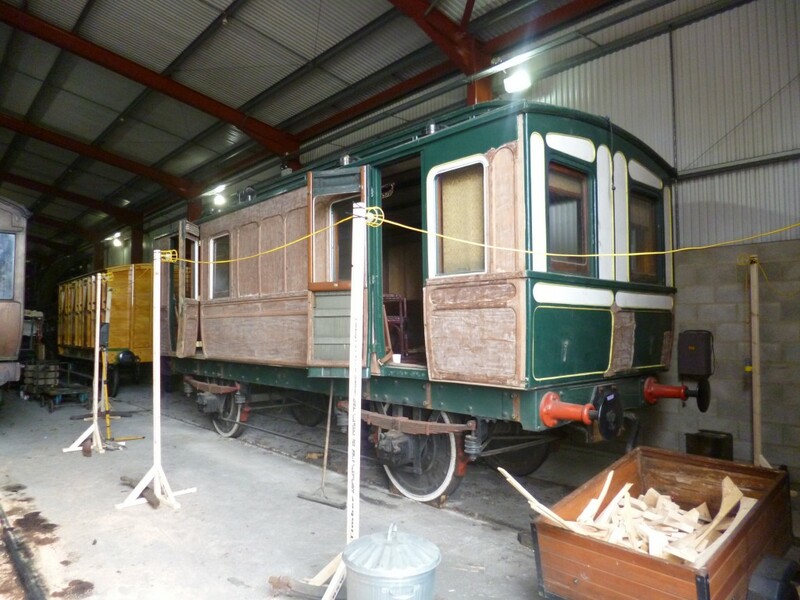 Phil is due back over the winter to progress further stripping of the paint and a start on the repainting. Exciting times! 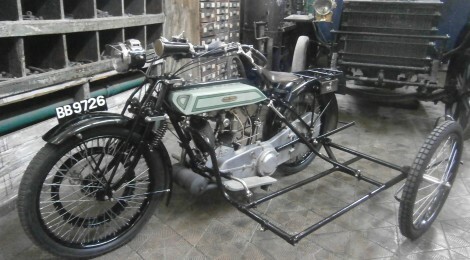 How are you going to get the Dene and sidecar out of the garage as the gate at the end of the counter looks to be too narrow?